Power goes through the 7 pins PS/2 mini-din that Roomba includes above. RooWifi Wi-Fi Remote for Roomba consumption is about 60mA for voltages next to 17V. This voltage is the power delivered by iRobot Roomba. The connection and communication with iRobot Roomba robot is done by mini-din connector 7 pin PS / 2 located on the top of the robot. 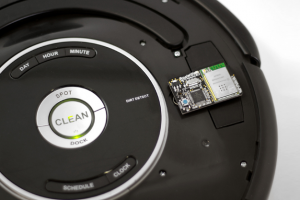 RooWifi Roomba Wi-Fi Remote’s communications protocol incorporates the robot SCI (Serial Command Interface). Setting the communications speed is performed automatically in the ignition process of Roomba Wi-Fi Remote. This communication way permits the configuration to be done completely transparent to the user letting them focus on telemetry commands to control the robot. Key protected SSID for personal and enterprise Wi-Fi networks. Open security in Hot-Spot mode and for personal and enterprise Wi-Fi networks. Baud rate: 1 y 2 Mbps. 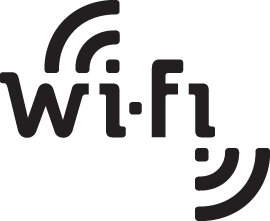 RooWifi has a LED to show users in which state the device is working on (referred to the Wi-Fi connection status). Roomba Wi-Fi adapter is ready in Hotspot mode. Roomba Wi-Fi adapter is ready and connected to a home network. RooWifi enables you to restore the default Wi-Fi mode (Roomba Wi-Fi module in Hotspot mode) manually if any problem exists during the connection or other kind of issue (ex: Forgotten IP address without DHCP). Socket Server / Gateway Mode. Send Clean, Spot and Dock commands using URL through GET AJAX Requests. Read sensors using XML or JSON files. User interface can connect to the device via web browser (TCP port 80 –HTTP-). Robot control and configuration is done via web application with access restricted by username and password natively installed on the module. Data is refreshed every 500ms to display telemetry robot online. Roomba Wi-Fi Remote module has an enabled TCP 9001 port for applications developed as client-server. The device starts working in this mode when port 9001 detects new connection, disabling the web server until disconnected. Baud rate configuration is automatically set and developers are able to use this port just sending SCI commands to control the robot. Physical Layer: MINI-DIN 7 PINS – PS/2. 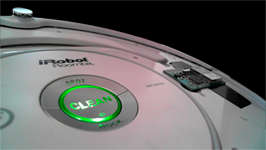 Application Layer: SCI iRobot Roomba Protocol in standalone mode or defined by user’s software in Gateway Mode. Physical Layer: Wi-Fi IEEE 802.11b compatible with IEEE 802.11b, 802.11g and 802.11n wireless networks. Web Server through HTTP TCP Port (80) with authentication. TCP Socket Server for client-server applications. 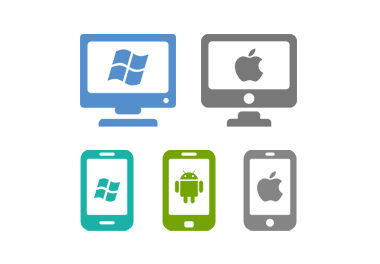 XML: Read-only with data refresh of 500ms. JSON: Read-only with data refresh of 500ms. AJAX Request through GET Calls and text format output. Range: Up to 400m (Open Field). Baud rate: 1 and 2 Mbps.